Still not convinced about the power of social media? Wondering what the benefit is for your small business? With more than 2 billion worldwide users, your customers are already there. That makes social media a crucial part of your brand's marketing strategy. But while you should be on social media, knowing where to begin is easier said than done. Below we'll take a look at 8 ways you can start using social media to expand and grow your business. According to Social Media Examiner’s 2017 Social Media Marketing Industry Report, more than 65% of small businesses are on social media to increase leads. But the biggest advantage of using social media isn't just the leads. It's the ability to generate highly qualified leads through advanced targeting. And yet, in Ascend2's findings, improving the quality of leads proved to be a big barrier to success. So how can you use social media to overcome that barrier and improve the quality of leads for your small business? A great place to start is by promoting gated content on social media. For this, you need content that's compatible with the interests of your followers. To understand this better, let’s look at an example from MarketingProfs. One of their latest posts directs followers to their virtual conference. The image is relevant to the content (and their audience), it's clear and easily understandable, setting the expectation for their Twitter followers. There's a lot of debate around this topic, but the bottom line is this... social media can (and will) improve your search engine ranking. How? The domain authority of your website increases when the social media share rate increases. This leads to an improved search engine ranking of your pages. But it's more than just that. Many consumers visit your social media profiles before heading to your website to get a better understanding of your brand before they make a purchase. More visits to your social media profiles will boost your social media page ranking, and improve their chances of appearing among the top ranked pages. 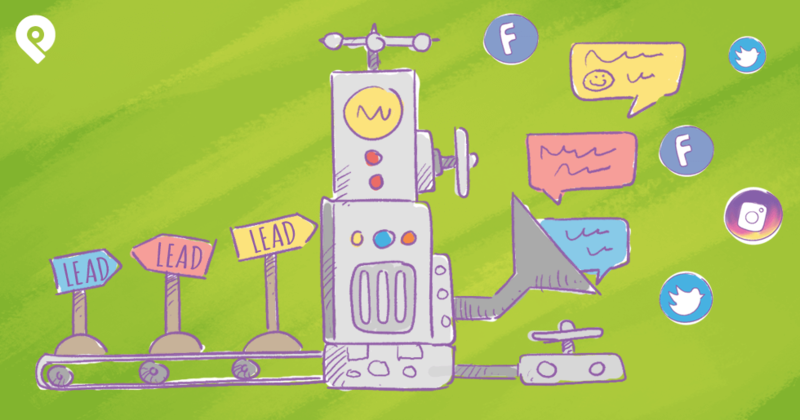 Use free tools like Pro Rank Tracker or Tiny Rocket to keep track of your ranking. If you're not creating visually appealing content that captures audience attention, your competition is. 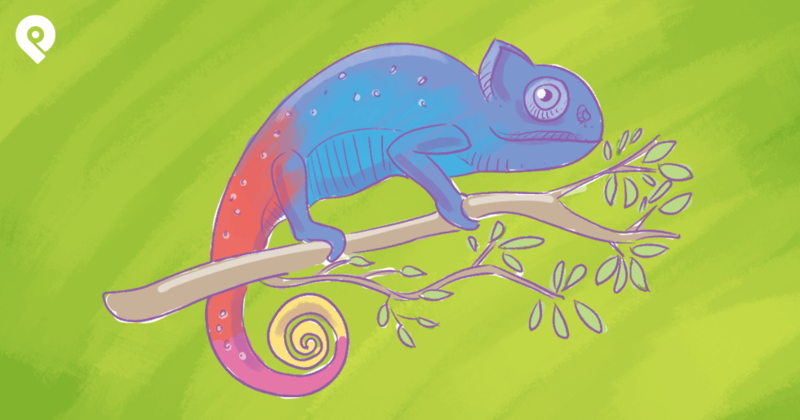 Here's how visual marketing can help you stand out online! Generally, small businesses use social media with a goal to increase traffic to a website. This theory was supported by the same Social Media Examiner report I mentioned above with 78% of small businesses saying they use social media to increase their website traffic. If you don't have a strong presence on social media, you're losing out on organically generated traffic. 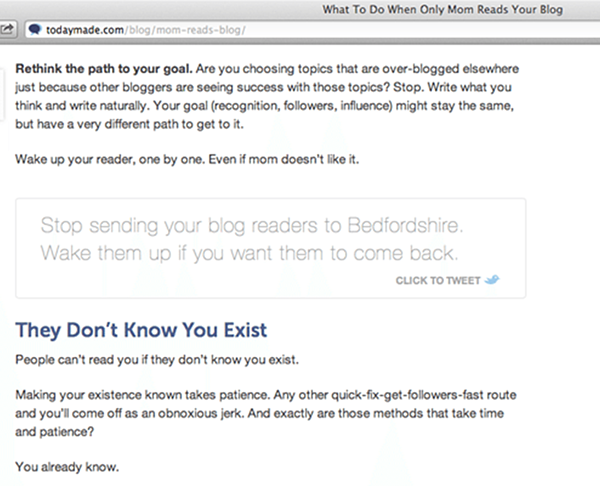 This means that your traffic is generated from the same limited number of people currently following you. Bad idea. You need to expand your brand reach if you want to drive more traffic. But where do you begin? 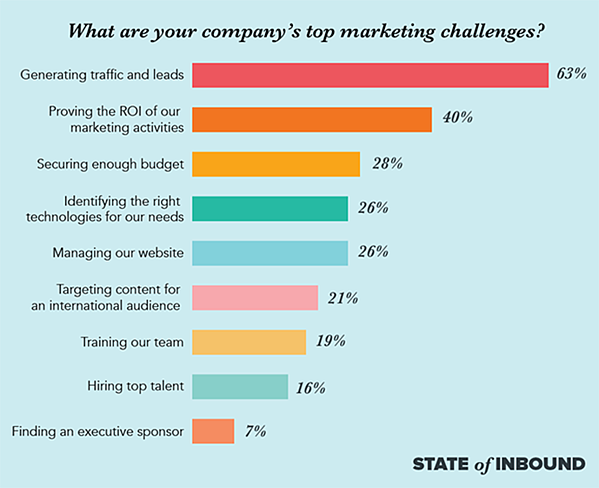 Especially given the 2017 State of Inbound report which found that 63% of companies face the challenge of generating traffic and leads. So how do you generate traffic? What is the most effective way? 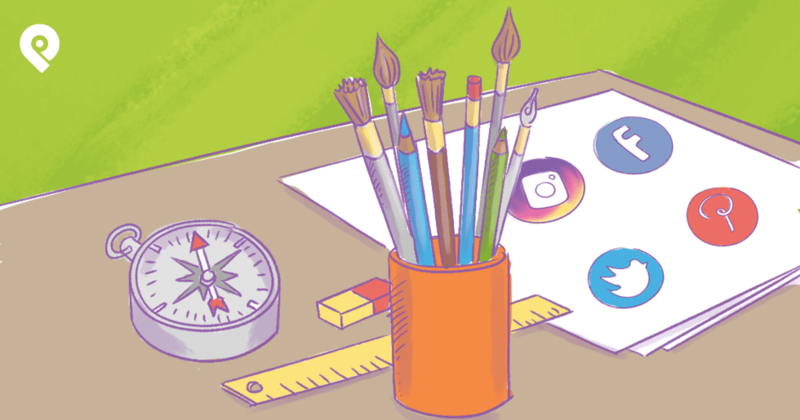 First, create a profile for your small business on each relevant social media platform. Then, leverage these platforms by sharing customized content to each of them. An effective social media presence will encourage your followers to go through your lead funnel and eventually reach your product purchasing page. 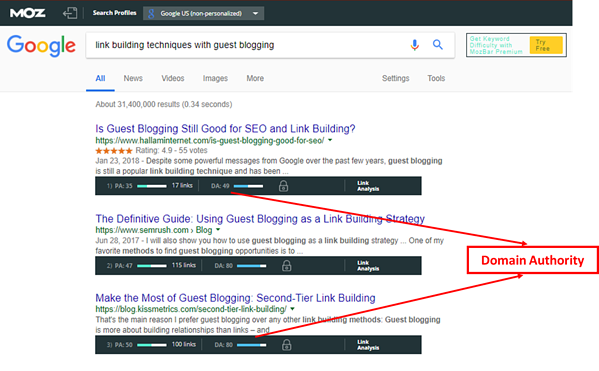 Second, make sure you make it effortless for audiences to share your content with social sharing buttons prominently displayed on your website. Additionally, you can add a Click to Tweet feature on an interesting statistic, quote, or other information to make it more shareable. 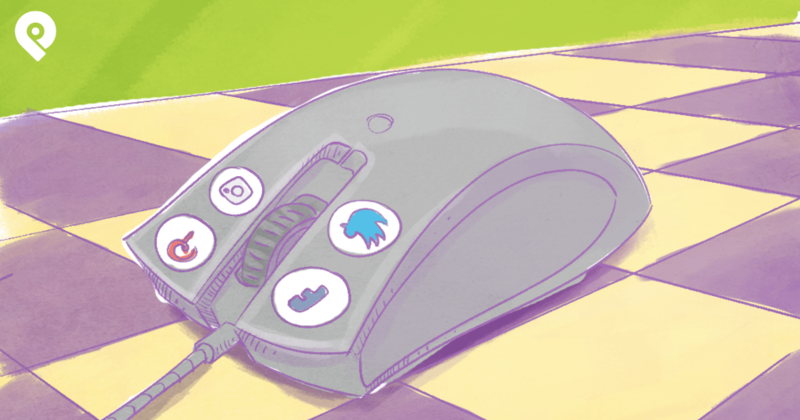 Now it's just a click away for readers to share your content. This may sound strange, but social media is a great way to keep an eye on your competitors. It gives you the opportunity to monitor and draw inspiration from their performance. You can see what type of content they're posting, and how they're interacting with their followers. Social media can also help you learn from your competitors. There has to be a good reason why your competitors are performing better than you. 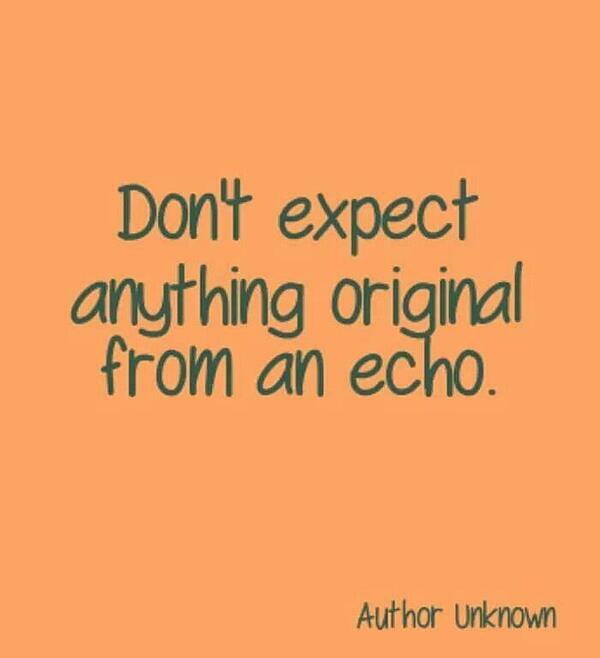 Learn their strategies, but make sure you don’t just copy and follow them. What works best for them isn't always best for you. Instead, tweak their ideas and make them your own. Competitive analysis on social media is all about learning from the successes and mistakes of your competitors. It's also useful and important to self-analyze and see where you stand compared to your competition. There are a number of tools you can use to conduct competitive analysis. 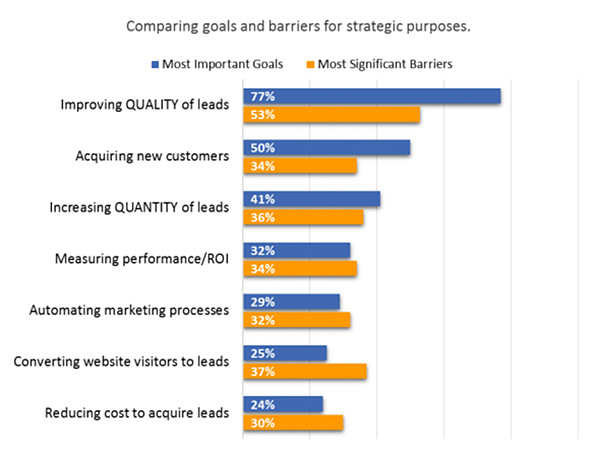 The tool you select should meet your marketing team’s specific goals. And before you jump in and decide on which tool to use, check if the company offers a free trial period. Social media is so much more than just a platform for promoting and selling your small businesses services or products. It gives you the opportunity to build trust with customers and develop loyal customers. In the survey conducted by Social Media Examiner, nearly 79% of marketers agreed that social media is as an effective way to develop loyal followers. Now that we know social media can be used for developing a loyal fan base, let’s see how it can be done. All content you post on your social media profiles should be authentic, unique, relatable, and engaging for your audience. 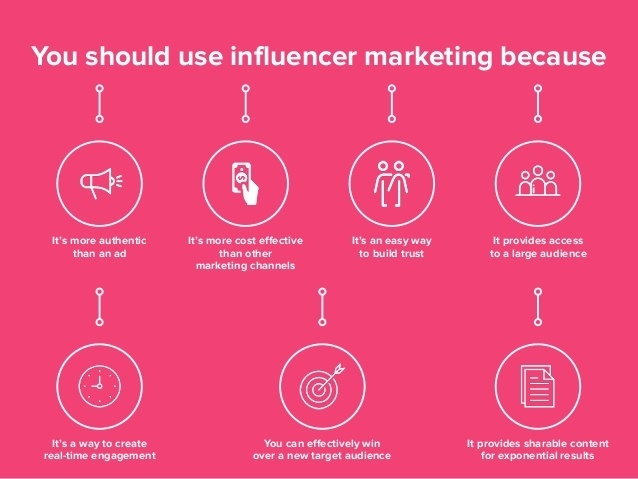 One way to make sure that your content has these qualities is to collaborate with an influencer to promote your product or services. Influencers share their personal experiences regarding your product and this is one of the biggest advantages to collaborating with them. Their stories are real, engaging, and authentic. It's easy for a customer to relate to their stories and believe them. The major obstacle with this method, however is, to find and collaborate with a relevant influencer for your brand. There are many platforms and tools available which help you to find an appropriate influencers for your brand. Platforms like Grin and Buzzweb can make the job of finding relevant and trustworthy influencers easy for you. 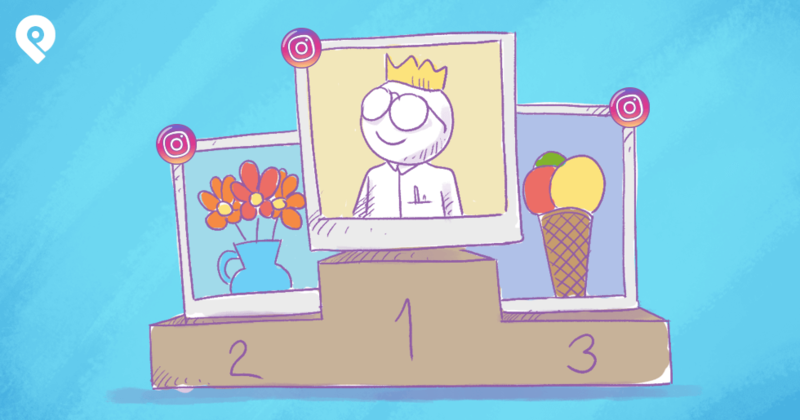 Using their advanced filters, you can look for the most suitable influencers based on follower count, engagement rate, and niche. Julie Sariñana is a fashion blogger with more than 4 million followers on her Instagram account. Fashion brand H&M collaborated with her to promote their 2017 fall collection. 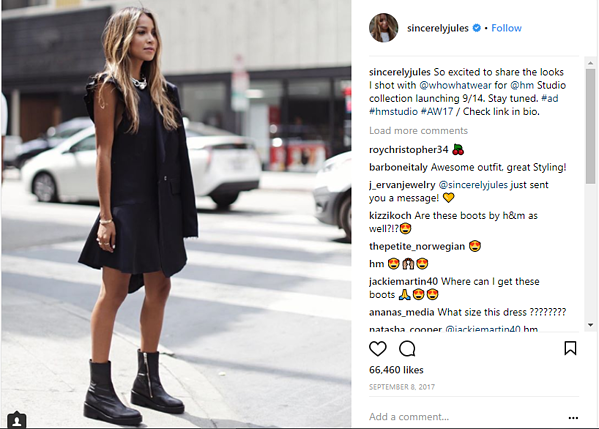 Julie loved the fall collection, and promoted it on her Instagram account. Her post managed to garner more than 66,000 likes. For any small business, raising awareness is a top goal. This is typically the case because we know that people prefer to purchase from brands they recognize. That's where social media comes in. When compared to traditional media, social media can put your brand in front of your target audience faster and easier. Plus, it gets your target audience to think about your company, even when they're not. Make sure to invest your time into creating and posting relevant content, cover images, and profile photos on social platforms. Place your logo strategically so that it leaves a long-lasting impact in the mind of prospects. Don’t place your logo in a place that will either be distracting or overwhelming. Also, don’t forget to focus on the visual elements of your brand. For instance, when you look at the Twitter profile page of Nike, you'll notice it’s clean and crisp. The images are simple. They've added their logo as their profile picture and their cover image is their famous tagline. Social media platforms can help you establish your small business as a topical authority. Meaning, in your niche, your brand becomes a trusted source of information. But how can social media help you establish topical authority? You need to regularly post content relevant to your niche. The search engines will then start to recognize your authority in the that niche. 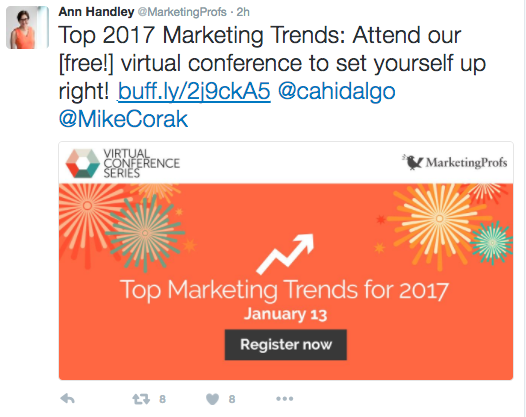 This helps your brand become the go-to authority for any topic. If your page has a high authority, it will also generate high-quality traffic to your website. If you're searching for content as sources for your writing, you can use tools to find a reliable source. Remember, the higher the number, the more reliable the page is. For any small business, the generation of high-quality traffic isn't the only goal. In order to succeed, you have to convert that traffic into paying customers. But how can you drive a high conversion rate on social media? Here are two of the most effective methods. A strong call-to-action is important as it directs and motivates potential customers on what to do next. Which can help potential customers feel motivated to make a purchase. Similarly, you can design an appealing call-to-action and post it on your social media profiles. This will encourage your followers to take the required action, which could be purchasing your product or services. For example, have you noticed Domino’s Pizza’s message on their Facebook cover page? They're encouraging their followers to order online or by phone to gain points to get free pizza. The advantage of an ad like this is that it can be used anywhere on social media. And it will direct and motivate prospects to visit your website and make a purchase. The key is to make the whole process from CTA to purchase engaging. Otherwise it can instantly demotivate your prospects and it prevent them from completing the purchasing cycle. Who doesn’t like discounts and giveaways? Regardless of the type of business, this method is super cost-effective and an impactful way to generate sales. It can also help to promote your products. Organizing contests or giveaways can also be fun and entertaining. They help increase your engagement rate as potential customers will start engaging with your brand more in the hopes of winning something. This can increase the awareness of your service or product as customers excitedly share news about the discounts with their friends. 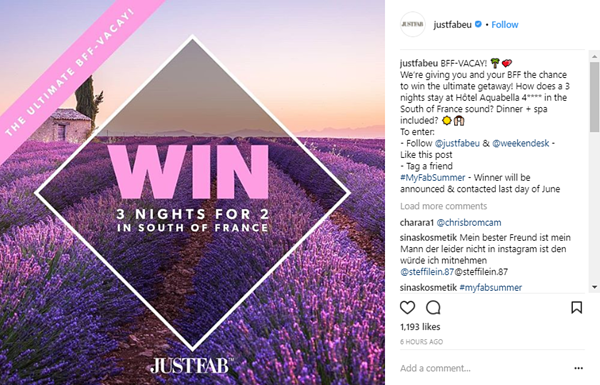 For instance, JustFab, a fashion and clothing brand from the UK, gave away 3 nights for 2 people in South France. The screenshot below is a great example of organizing a giveaway. As you can see, they've clearly mentioned the steps to follow and when the winners will be announced. This will attract and motivate people to visit their site. You now have a better understanding of how social media can be beneficial to your small business. Just remember: not all types of content or strategies mentioned will work for your company. Test each one, learn from your findings, and continue to make improvements. Now it’s your turn to include social media in your small business marketing strategy. Do you have any questions or tips to add? Please share them with us in the comments below.